Without a doubt one of the biggest developments in technology over the past decade has been the rise of social media. Ten years ago it was a phrase I’d honestly never even heard of; I think we had MySpace and that was about it. Today it is a sector that is shaping how we behave, communicate, absorb information and, judging by the numerous political campaigns over the past few years, even the way we do politics. Facebook, the undisputed number one of social media companies, has been at the forefront of that. As of Q1 2016 the company report that 1.07 billion users – that’s 15% of the planet’s population – are active on a daily basis. The meteoric rise of the company and it’s social media platform has also been mirrored by the stock. 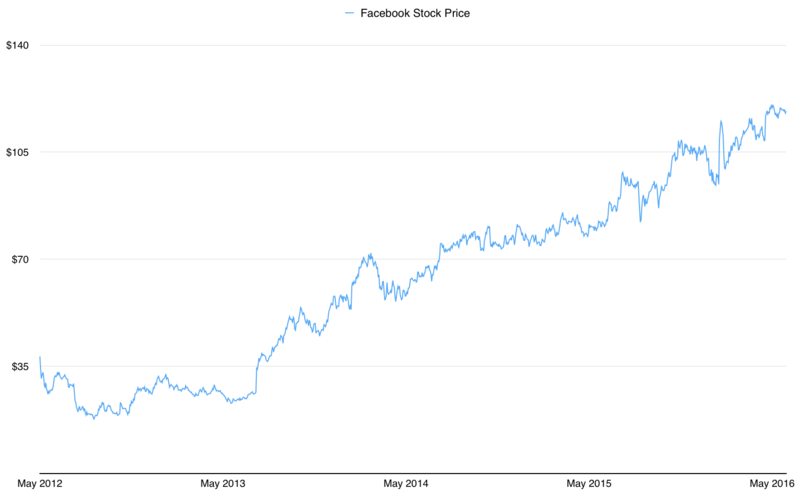 It was only in 2012 that Facebook IPO’d with a first trading day close of $38 a share valuing the company at $90 billion. Three years before that Digital Sky Technologies bought 2% of the company for $200m, putting the value of the company at $10 billion in 2009. That was an eye-popping figure even back then, and yet today the shares are currently changing hands for $118 a piece – equal to a market capitalization of $340 billion. There are two things that are remarkable about that gargantuan value. The first is obviously the enormous amount of growth expectation that is baked into the stock: Facebook is currently valued at around the same level as Berkshire Hathaway, a company that already makes around $20 billion each year in net income. The second point, and directly related to the first, is that current global advertising spending is $560 billion a year. In other words Facebook’s market value today is worth about 60% of the entire amount of global spending on all forms of advertising in 2016. That’s not just online advertising by the way; it includes television (still the largest medium by revenue share), print media, radio and outdoor advertising such as good old fashioned billboards. There might well be a myriad of new monetization possibilities as social media continues to evolve, however right now Facebook remains reliant on ad revenue. The company has hit the headlines over the last few years due to it monstrous acquisition of WhatsApp – which valued the messaging app at an equally mind boggling $19 billion – and it also has Instagram in its stable. Despite that the company so far earns its income by monetizing that enormous figure of 1.07 billion daily Facebook users for advertising. It’s sophisticated targeting, full of complex and new ways of reaching potential customers, but so far at least it’s still advertising. Last year Facebook was able to report revenue of $17 billion, made up primarily of advertising sales. Out of that figure it had to spend $2.9 billion on various operating costs such as expenses associated with its data centers and so on. It also spent $4.8 billion on research and development; $2.7 billion on marketing; $1.3 billion on administrative expenses such as employee salaries; and, finally, it had a tax bill of $2.5 billion. Total net income was therefore $3.7 billion. If we compare that number to its market value we get a price to prior year earnings ratio at 91. Granted the company is growing extremely quickly: in 2014 Facebook made $2.95 billion in net profit on revenue of $12.5 billion, and in the first quarter of 2016 it posted $5.4 billion in sales and $1.85 billion in free cash flow. Yet there seems something crazy about paying 90x last year’s earnings for the stock. The growth baked into a company of this size is almost unprecedented in terms of generating good future returns over the next couple of decades from the stock. Imagine you are gifted 100% of the share capital of Facebook on the condition that you have to either keep it for the next two decades or sell up immediately. The first option means you have ownership of a fast growing, dynamic social media and technology company that last year made $3.7 billion in net profit. On a per share basis that translates to $1.29 which, at a share price of $118, means that each share you own is currently worth 91x what the company made last year. So far those advertising profits are still growing enormously, with the first three months of 2016 alone generating $0.77 in income per share. The second option means that you have to sell up all your Facebook shares and pocket the $340 billion cash. What other assets could you get for that vast sum of money? You could go for one mega-purchase, where $340 billion would get you Johnson & Johnson with $22 billion in change. As a vast collection of diversified healthcare companies it would give you ownership of about $70 billion in revenue and $15 billion in net income as of last year. Split it into two purchases and Facebook’s market value would get you both Coca-Cola and PepsiCo, along with their combined $14 billion worth of net profit. What if you wanted to be diversified across a small number of high quality businesses, each with a long track record of sustainable profitability? You could pick up 50% of Johnson & Johnson for about $160 billion as the linchpin of the portfolio, supporting it with Diageo and Brown-Forman for a combined sum of $90 billion. With the remaining $90 billion you could mop up 45% of the world’s toothpaste market share with Colgate-Palmolive ($65 billion) and 40% of the US chocolate market with candy company Hershey ($20 billion). Here’s what that mini-conglomerate gets you in terms of annual profit: $0.90 billion from Hershey; $3.45 billion from Diageo; $0.7 billion form Brown-Forman; $1.4 billion from Colgate-Palmolive; and $7.5 billion from Johnson & Johnson. In “here and now” profits that mini collection would already have raked in $15 billion last year against $3.7 billion for Facebook. How much of Facebook’s future growth is baked into the current valuation multiple? Will it be like many of the Nifty Fifty components whose solid businesses allowed them to compound at a good rate over a forty year period? It’s a hard sell. Most of the technology stocks on the Nifty list performed pretty poorly. Even Microsoft of the early 2000s has taken over a decade to shake off its dot-com valuation (see here). Maybe it’s different this time, but if history is any guide then a similar fate could well lay ahead for Facebook stock.